The World Cup soccer tournament, which runs through the championship game on July 15, has meant extended hours, additional staff and — so far — an increase in sales for several local soccer-friendly bars. On the other hand, some owners lament that the absence of the American team — the United States did not qualify — has likely weakened the interest by average Philadelphia residents. "It's been great, especially when Germany was playing," said Doug Hager, the owner of Brauhaus Schmitz, a German beer bar on South Street. "It's interesting with this tournament being played [in Russia] so early in the day. From a purely business perspective, it's fantastic because we had 250 people in here at 10 a.m. [on Wednesday], when we normally aren't even open yet." Fado Irish Pub, on Locust Street, has opened its doors around 7 every morning to accommodate its World Cup fans, and that has resulted in a higher demand for servers and bartenders and caused severe adjustments to their schedules. To spread the word about its additional hours, Fado used posters and social media posts. "Every single game has been busy. It doesn't matter what games they are." said Stephanie Henry, the general manager at Fado. 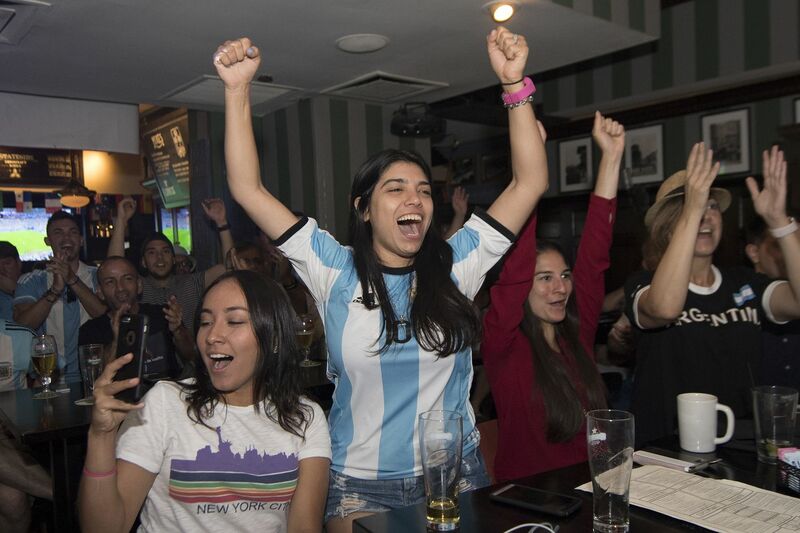 Argentina fan Tomas Alziel celebrates a score during a World Cup game against Nigeria at Fado. The workers at Fado have seen a particularly large crowd of fans for games featuring Colombia, Portugal, and France. But one group of fans for Argentina has found a new home at the pub. Argentina Philadelphia was founded 10 years ago by Diaro Bellot, a native of Argentina, and a group of his friends. The club has more than 3,000 members these days. "We tried to get what is the culture and tradition of Argentina here in Philadelphia," said Bellot. Fado and Misconduct Tavern, also on Locust Street, have attracted many fans of England's Premier League over the years. Kenny Atkins was born in Miami, but his family is from Nigeria. The convenience of Fado to his workplace was perfect for him to watch Argentina's nail-biting 2-1 victory over Nigeria on Tuesday. "I've lived in Philadelphia for a little while now, and this bar has the reputation as a soccer bar," Atkins said. "And I knew that on a Tuesday, leaving work around noon, that the chances were high to run into like-minded soccer fans. So it was either this bar or Misconduct." Workers at Misconduct Tavern, directly across the street from Fado, have also seen consistent crowds for the soccer games. They saw particularly large crowds at afternoon games last weekend. The place was full when Colombia beat Poland last Sunday. Samantha Hopkins, a bartender at Misconduct, had to adjust to her heavier workweek, and others said they worked up to 90 hours to accommodate the early-morning crowds. "It makes for a long day when you come in at 7 a.m.," Hopkins said. Ben Ferber and Sammon Dediedhiou, customers at Misconduct last Sunday for the Colombia and Senegal matches, knew that Misconduct would be open no matter when the World Cup games were played. Dediedhiou, a native of Senegal, was visiting the United States for a couple of weeks and relied on Ferber, who has lived in Philadelphia for a few years, to know where the best spot would be to view the games. Nigeria fan Kene Akins (center) reacts at Fado during the World Cup game against Argentina. Bars such as Brauhaus Schmitz and Gran Caffe L'Aquila, on Chestnut Street, used their international connections to Germany and Italy, respectively, to attract this year's soccer crowd. Brauhaus Schmitz benefited greatly from Germany's being in the World Cup, even though it was eliminated in group play. For people at Gran Caffe L'Aquila, the atmosphere at the restaurant four years ago was more exciting because both Italy and the U.S. team — neither one is playing this year — were in that World Cup. That was when Darreno Jacobezzi, the general manager at Gran Caffe L'Aquila, started working at the restaurant. "When Italy was in [the tournament], it was insane, like unreal," Jacobezzi said. "I don't even have words. It was one of the best moments of working here." Hager, of Brauhaus Schmitz, said that he still intends to have a championship game viewing party even though Germany will not be in it. "We support soccer all year round, not just for the World Cup," Hager said. "I think our customers appreciate that, and they come in, and they know this is a place to come in and watch the tournament."